. . . and babies make four. : Five . . . and a half. Five . . . and a half. 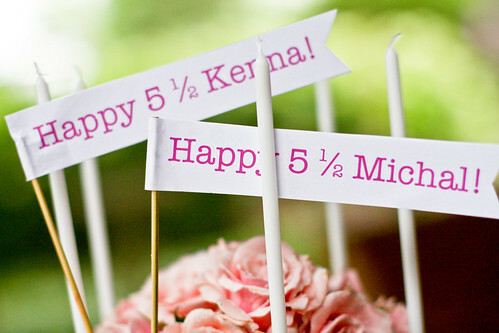 Today Michal and Kenna are five-and-a-half. That half is very important to them. They've been saying they were five-and-a-quarter for the last few months and are now thrilled, and I mean thrilled, to change that quarter to a half. This morning I heard Kenna tell Michal as they headed toward our bedroom to see if I was awake, "She's not asleep. She's downstairs baking us a cake." It was 6:15 a.m. and I was still nestled soundly in my bed. I did bake a cake though . . . just a little later in the morning. So Happy "Half Birthday" my little girls! 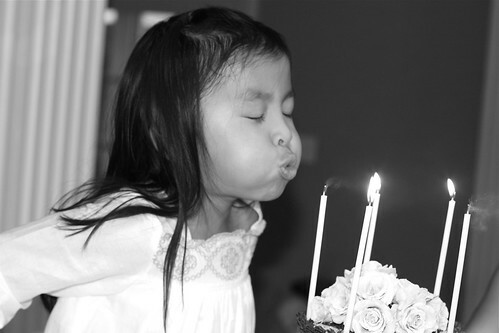 Now could you please stop getting older? Wow! 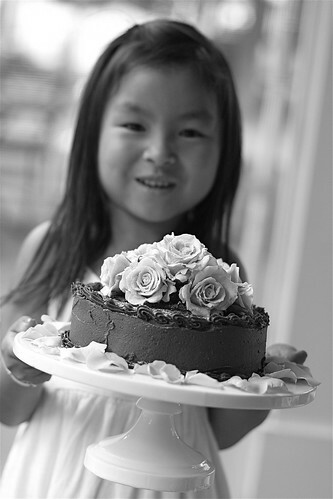 Your pictures are beautiful-and, wow, look at that cake! It looks professional! What a gorgeous cake, Kristi! And what a great idea it is to celebrate 1/2 birthdays. It's too hard to believe that Michal and Kenna are already 5 1/2. Yikes. Kindergarten coming up in the fall. Wasn't it just yesterday that they graduated to their big-girl beds? that cake and your girls are beautiful!! 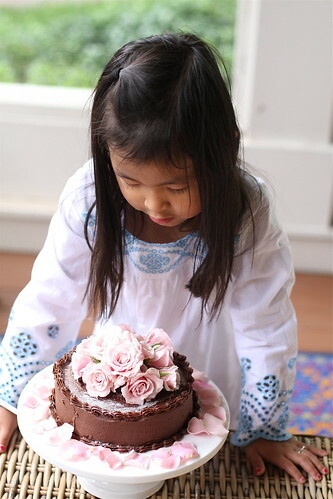 Wow, you are talented to make such a beautiful cake! Happy 5 1/2 to your sweet daughters! 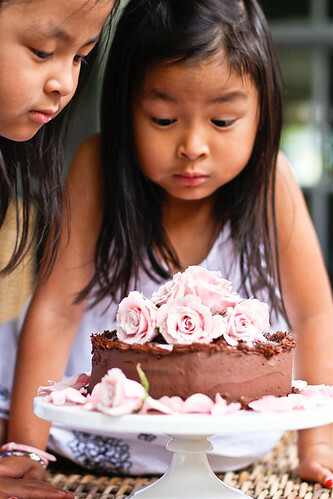 Since their actual birthday is right in the middle of the holiday rush I think it's wonderful that you do a little "half" birthday for them in the summer... cute idea! Are the girls starting kindergarten in the fall? Okay, Martha...where did you get the flowers? Are they edible? Love the cake! My little one (4 and a HALF) celbrated the "halfway" mark, too! I'm totally laughing at the Martha comment! 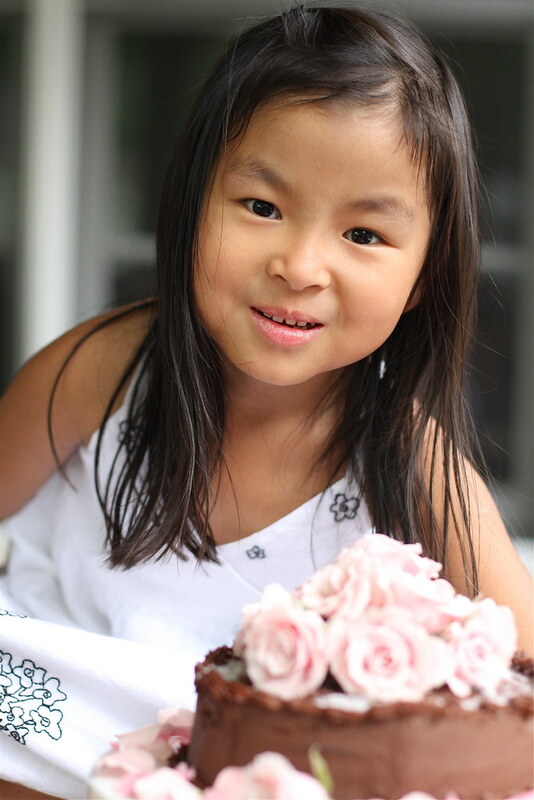 The flowers (11 of them - 5.5 + 5.5) were real spray roses that the girls and I sugared. We painted them with beaten egg whites and then sprinkled granulated sugar on the egg and let it dry. If we had been meticulous about coating every speck of the rose petals with egg white and sugar it would have "preserved" the roses so they could have been saved for up to a year. 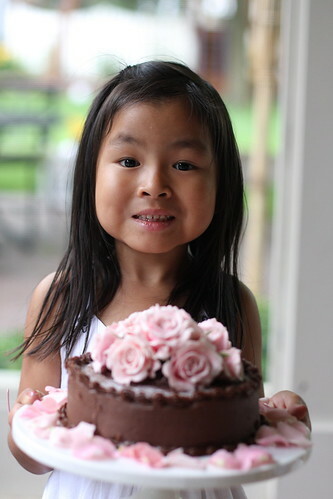 We weren't meticulous though so the roses only sat on top of the cake and then were thrown away. It's easiest to crystallize rose petals or flat, edible flowers like pansies. You can also sugar fruit but you can't save it! Happy half birthday to your big girls! Happy 5 and a half!!!! 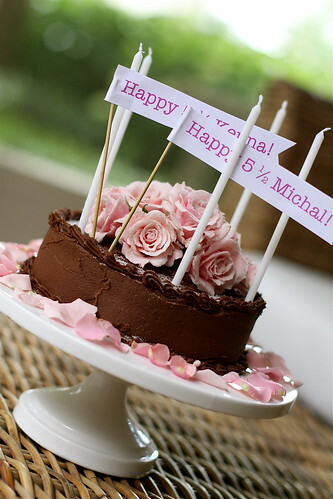 Happy 5.5 Michal and Kenna!! 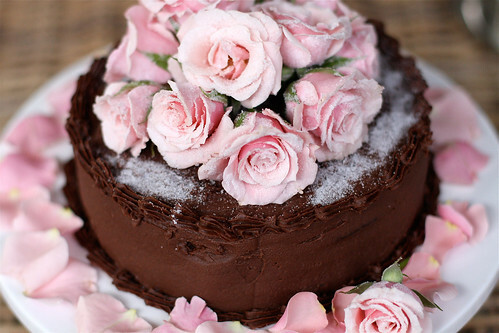 You look as scrumptious as the beautiful cake! I have been reading your blog for awhile now. 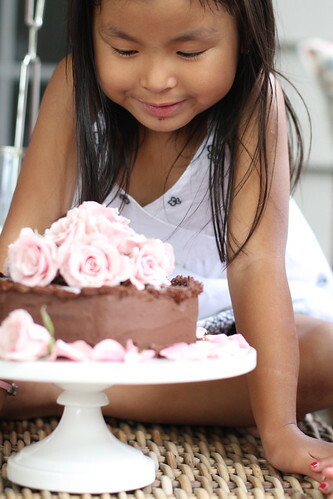 I just love your pictures of the girls and the cake. Wow!!! It was beautiful! Happy half birthday, girls!! Beautiful cake!! Happy 5 and 1/2 Birthday and awesome cake!! I was going to ask about the flowers, but see that you already told your "how-to". Thank You!! I am getting married next year and would love to use these on my "cupcake" cake I am thinking of doing!! Lovely 1/2 birthday! You are too sweet to make everything so special. Your girls always look over the moon adorable! I love this idea of celebrating 1/2 birthdays! Cake! :) I love the cake, you did an amazing job!